Varsity Field Hockey Chomps a Win in the "B" Conference IAAM Championships! 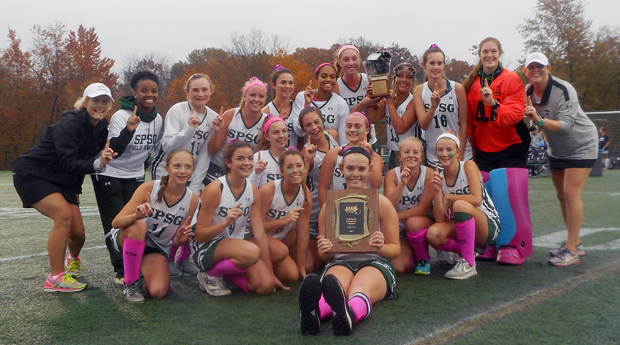 SPSG struck with lightning-like swiftness near the midway point of the opening period on unassisted back-to-back goals by junior forwards Caroline Pearce and Kerrigan Rogers within just 58 seconds of each other to take a 2-0 lead in what turned out to be a 3-0 triumph over Maryvale Prep in the B final. The Gators (12-2, 10-1) completed the scoring in the 36th minute when sophomore defender Liz Kennedy converted a feed from senior forward Natalie Bray for a 3-0 lead. The Lions threatened a couple of times in the second half, although they could not connect on a scoring play. Their best opportunity came on a scorching shot by freshman forward Emma Radebaugh that whistled wide with about 12 minutes remaining in regulation. The SPSG defense, which did allow three Maryvale penalty corners in the second half, was unyielding behind senior Grace Boyce, junior Emma Gitters and sophomores Kennedy and Maggie Norton fronting junior goalie Carson Stephenson (3 saves). "We came in with a lot of energy," Boyce said. "We were super excited to be here. When we got those two goals in quick succession, it really gave us an energy boost." Bray said that the Gators did not want complacency to ruin their bid for a first-ever B Conference crown — they did share an A Conference banner in 2001. "We've had problems with being too confident before," she said. "So we wanted to stay strong. We went for every ball. We weren't going to let up." Caroline Pearce and Kerrigan Rogers scored 58 seconds apart in the first half, and SPSG went on to a 3-0 victory over Maryvale. Maryvale pressured SPSG early on but the goals from Pearce and Rogers quickly gave the Gators control. Pearce gave SPSG (11-2) a 1-0 lead when she came in and made a shot from a tough angle against Maryvale goalie Sophie Shucosky (five saves) with 11:18 left in the first half. That seemed to fire up the Gators. They came right back and Rogers scored from in front 58 seconds later for the quick 2-0 lead. The lead remained 2-0 at halftime before SPSG added one more early in the second half. Liz Kennedy made it 3-0, also scoring from right in front of the cage, with an assist from Natalie Bray. That proved to be more than enough for the Gators on a drizzly afternoon. The Lions pressured SPSG at times, but goalie Carson Stephenson (four saves) made some good stops, especially a late kick save. The Gators had beaten Maryvale (12-7) earlier in the season, and the Lions continued to have bad luck in the championship games, falling to John Carroll in 2016.